Of course they abandoned it because, of course, it wouldn't work. It comes down to that one pesky element that always spoils a developer's fun: the human players, with their irritating free will and attention spans. Either the soldiers are going to do whatever they bloody well please and the commander can't do more than offer helpful suggestions, or the soldiers' freedom will be restricted and they'll start to feel ... well, like the main character of Crackdown 2, a helpless pawn who isn't allowed to see the big picture and can only blindly follow orders. That was the obligatory callback to last week's video, by the way. Hope everyone enjoyed it. 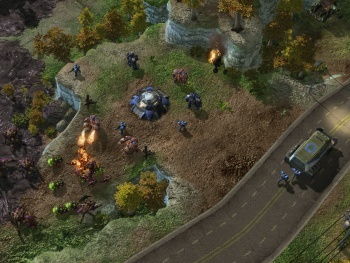 But I've been thinking about the matter - probably because no one can shut their fat bleeding holes about StarCraft 2 right now - and I think real time strategy players could potentially coexist with soloists on the front line. I think the problem with the above idea is that it assumes that both the commander and the soldiers are both in pursuit of the same goal: to win. That's certainly the RTS player's goal - what is RTS if not chess scaled up with an orchestral soundtrack - but not the player of a first- or third-person shooter. One does not play through, say, BioShock just for the sake of victory against Andrew Ryan. One plays it for the experience of playing it. Here's my proposal. Start with the standard RTS model - two players directly controlling two warring armies of units across a massive battlefield. But also spawning on the map is a third group. Mercenaries, individual warriors controlled by human players as in a third person sandbox shooter. They can do whatever they want. Fight amongst themselves, fight troops of either side, blow places up, steal vehicles, basically everything they could do in, say, Just Cause 2. At any time the RTS commanders can pledge a certain amount of money and weaponry to post a mission on the mercenary noticeboard. Say, to kill a certain amount of the other commander's troops, or blow up certain of their vehicles or buildings, or assassinate a commando, whatever. The mercenaries receive some of the pledged reward when they accept the mission and receive the rest upon completion. The mercenaries get to have their fun and the commander gains an advantage in the larger battle, so everybody's happy. But absolutely no loyalty is expected of the free agents. They can do missions for whichever side is paying, then collect the money and go straight to the other side to buy a rocket launcher and some water skiing equipment. The mercenaries can buy weapons, vehicles and other equipment from either side, but the commanders can only sell them once they've built the necessary structures and upgrades to research and develop them. This creates a separate source of income for the rest of the commander's war effort, and creates a dynamic incentive to develop resources. The idea probably needs testing, as I can already think of some issues with it. One of the commanders could get a mate to go in as a mercenary to work solely for them, but then again, what if the other side is the first to develop nuclear pogo sticks? What a test of loyalty that would be. And the system almost seems tailor made for griefers. I imagine a lot of the mercenaries may be inclined to antagonize both armchair generals and invite them to come down from their ivory towers and have a go if they're not too scaredy-wared. But here's the thing - the generals could then switch modes and do exactly that. In fact, why not have it so when the war is won the losing general automatically shifts to a third person viewpoint and must flee the battlefield with a small unit of personal guards? Maybe he could stealth his way to safety or maybe the mercenaries will find him and string him up by his figgin. And then of course there's the issue that maybe RTS players would rather just play a straightforward RTS without a bunch of hooligans running around messing up all their careful strategies, but as you can probably tell, I can't really think on the level of the RTS-playing mindset. For whatever it's worth, it could be done, but whether it should be done is another matter. Genre mixing never really ends well. That's something BrÃ¼tal Legend should have picked up on.